Ocasio-Cortez wants higher taxes on very rich Americans. Here’s how much money that could raise. (Susan Walsh | AP file photo) In this Nov. 14, 2018 photo, Rep.-elect Alexandria Ocasio-Cortez, D-N.Y., talks with reporters following a photo opportunity on Capitol Hill in Washington. While tea party Republicans swept to power to stop things -- repeal Obamacare, roll back environmental regulations and decrease the size and scope of government -- Democrats are marching into the majority to build things back up. And after spending eight downcast years in the minority, they can’t wait to get started. 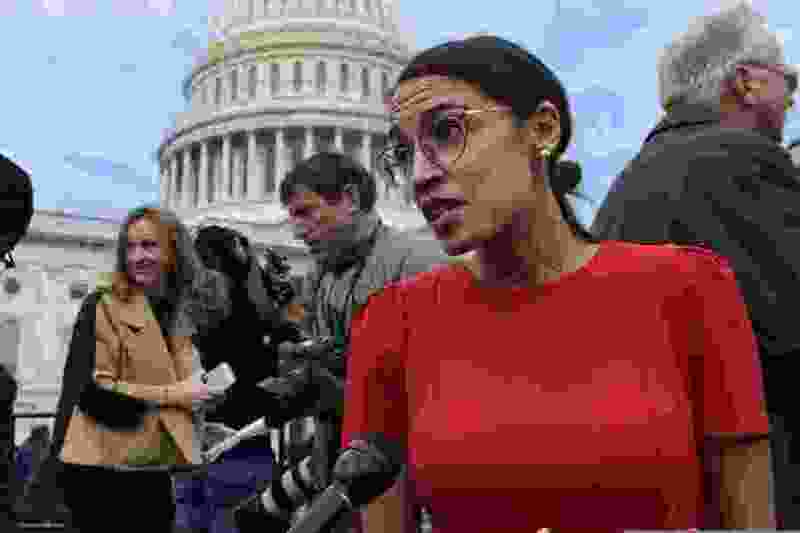 Rep. Alexandria Ocasio-Cortez, D-N.Y., floated a 60 to 70 percent tax rate on the richest Americans in an interview with CBS News's "60 Minutes" that was released Friday, arguing higher taxes on multimillionaires could help pay for the "Green New Deal" she and other left-wing members of the Democratic Party have proposed. Talking to Anderson Cooper, the new House member suggested the new tax rate apply to Americans earning more than $10 million a year, noting that similar rates existed in America a few decades ago. The top tax rate was above 90 percent during the 1950s, and while it has slowly descended, it remained as high as 50 percent for much of President Ronald Reagan's tenure in the 1980s. American households that earn more than $600,000 annually currently pay a 37 percent tax rate, down from the 39.6 percent rate they paid before the Republican tax law passed in 2017. Conservatives have pushed for lower taxes on the rich as a spur to economic growth, while liberals see potentially untapped revenue that could fund their key social spending priorities, such as Medicare for all and free college tuition. "There's an element where, yeah, people are going to have to start paying their fair share in taxes," Ocasio-Cortez told "60 Minutes." How much revenue could new taxes on the rich really raise? We looked at the numbers, enlisting the help of a number of tax experts, including Mark Mazur, a former Treasury Department official now at the Tax Policy Center, a centrist think tank; Joel Slemrod, a tax expert at the University of Michigan; and Ernie Tedeschi, an economist who served in President Obama's Treasury Department. In 2016, the latest year for which government data is available, approximately 16,000 Americans earned more than $10 million each. These are not in fact “the 1 percent” many on the left like to talk about — they are a much smaller slice, fewer than 0.05 percent of all U.S. households. It's difficult to estimate precisely how much more in taxes the government could wring from this ultra-elite. Collectively, their total taxable income amounted to $405 billion in 2016, and they paid about $121 billion in federal income taxes. They also face state and local taxes, which raise their overall tax burdens. As she noted to "60 Minutes," Ocasio-Cortez's idea for a 70 percent tax rate on those earning more than $10 million would only kick in beyond the first $10 million in income. So, this new tax rate would do nothing to add to the amount of federal revenue on the first $160 billion (16,000 people multiplied by $10 million) in taxes this group paid. But that leaves about $244 billion in taxable income for those earning more than $10 million a year. If this entire pool was taxed at 70 percent instead of the 39.6 percent they paid in 2016, the federal government would bring in an additional $72 billion annually — or close to $720 billion over 10 years, according to Mazur. The real number is probably smaller than that, because wealthy Americans would probably find ways around paying this much-higher tax. This $720 billion in a decade is not nearly enough to fund Medicare for all, which has been estimated to increase government outlays by about $30 trillion over a decade (while also zeroing out premiums and deductibles paid by Americans). Still, it could fund a number of other measures. It could come close to funding the entirety of Sen. Bernie Sanders' free college tuition plan ($800 billion), fund President Barack Obama's plan to get close to universal prekindergarten ($75 billion over a decade), forgive more than half the student debt in America ($1.4 trillion), cover Democratic leaders' plan for boosting teacher pay and school funding ($100 billion), or come close to funding a $1 trillion infrastructure plan. And of course, higher income tax rates on the top 16,000 households is not the only way to raise taxes on rich Americans. The American government currently raises tax revenue primarily through payroll taxes and income taxes, and gets a smaller chunk from estate taxes and corporate taxes. It has not adopted a kind of tax that exists in some European countries: a wealth tax, wherein the federal government takes a chunk based on household wealth rather than income. Norway, for instance, in 2016 taxed at a rate up to 0.70 percent for all wealth over 1.4 million kroner ($162,568). France's wealth tax in 2017 hit assets above 1.3 million euros ($1.4 million). Plus, this approach would require Americans to give the Internal Revenue Service a full accounting of all the assets they own under law - something that could be required under law but may prove difficult to evaluate. In 1990, the federal government did try something similar by placing excise taxes on sales of yachts, expensive automobiles, jewelry and other things consumed by rich people. But that effort came right before a minor recession, leading to the repeal of the taxes. "The difficulties of monitoring and compliance are huge," Mazur said of the wealth tax. "But it could be done and raise a lot of money." In 2012, the economists Peter Diamond of the Massachusetts Institute of Technology and Emmanuel Saez of the University of California at Berkeley published a paper arguing the optimal top tax rate is 73 percent. In 2018, that would raise the tax rate on income above $600,000 from 37 percent to 73 percent, but back then it meant increasing the top rate from 39.6 percent to 73 percent. The IRS says that Americans earning more than $600,000 annually compose the richest 0.9 percent of families, so we'll use that for shorthand for the 1 percent. In 2016, this richest 0.9 percent earned about $1.7 trillion in taxable income and paid about $530 billion in taxes. These Americans would have to pay an additional $320 billion every year in taxes if the top tax rate went up to 70 percent, according to calculations based on IRS data. Mazur, the former Treasury official, noted this estimate was probably high because the wealthy would probably find ways to try to shelter themselves from higher taxation, such as by buying tax-exempt bonds. Other economists found similar results. Tedeschi, the former Obama economist, put the number at about $300 billion annually. Meanwhile, raising tax rates for the top 1 percent to 57 percent would raise about $1.7 trillion over a decade, while raising it to 83 percent would raise $3.8 trillion over that period, Tedeschi found. "You can get a hell of a lot of a money from taxing the 1 percent," said Edward Wolff, a tax expert at New York University. The Congressional Budget Office also recently estimated that raising taxes on the two highest income brackets by 1 percentage point would net $123 billion over 10 years. That would be for everybody who earns more than $200,000 annually. But Americans outside the top 1 percent would probably pay at least part of both these taxes, Tedeshi said. Overall, just including a new wealth tax and significantly higher income taxes, the federal government could probably raise an additional $2 trillion to $3 trillion a decade by taxing the 1 percent alone, according to Tedeschi. A Draper dog groomer got mad at a customer. She was arrested after reportedly pulling a gun on him.